To Speak or Not to Speak…Should I Answer That Question? This week I’ve been attending an annual conference of Christian university students as one of the visiting speakers. The theme of the conference is ‘God Speaks’ and there has been a lot of speaking about God speaking – a lot of words about his words. I’ve been driving to and from the conference each day, listening to ABC radio – listening to a lot of people speaking about what others (mostly politicians) have spoken. This morning I was asked to speak to some of the students at the conference about my life and work on the other side of the world. I, a former Arts student, was very much aware that I was standing in front of 100 students from the Science Faculty of their university. My words and their words could quite possibly be considered different languages! But we seemed to understand each other pretty well. One of the things that has impacted me this week – ‘spoken to me’, if you like – has been the way that speech, what we say and how we say it, highlights experience and wisdom. One of the secondary aims of the conference is to allow students opportunity to gain experience in leading and speaking in group settings. While those of us with more experience in these areas are mostly required to sit quietly and let others have a go, it has been heartening to see the students gain confidence, not just in speaking words but, as they speak, being more confident of the beliefs and truths they are speaking out loud. It has really struck home to me this week, how important it is to speak out what we believe, to hear others speak, to respond to them in speech. Coming from one who tends toward verbal processing, this should not be a new revelation to me! I’ve certainly had to do a lot of work over the years, learning to listen more than I speak; to sit back and give others a chance to think quietly before they feel confident to speak. But in the end, speech is important. Words are vital. Communication depends upon it. I guess that’s why talk-back radio is so popular. It’s a chance for people to speak out what they believe or, for those less inclined to airing their views on national radio, to send in a text message or email containing their words. There was a question asked in one of the seminars this morning, and the speakers up the front took a while to think about their answer. I so wanted to speak up! To speak about the words I’d heard one older and wiser speaker share last year – words that would have answered the question. But it wasn’t the time for me to speak. And, with time, the speakers up the front spoke. Later, two students approached me with ‘many questions’, they said. Yet, words failed them. They couldn’t, at first, give words to what they wanted to ask. We stood in silence for a while. I spoke first assuming they wanted to ask follow up questions about my work on the other side of the world. I should have stayed silent a little longer. Their questions were a follow up to the question that had been asked in the previous session. They had no idea that I might have had an answer – an answer that I’d heard from someone else. But I was able to make a start on helping them with that answer. That moment was the right time for me to speak. What were they asking about? With reference to the previous session about the Psalms in the Bible, they wondered if it was OK to say or sing the words of the Psalms if we didn’t feel like the Psalmist felt when originally writing it. Essentially, can we speak something as truth if it doesn’t feel like our truth at that time? We agreed that often actually speaking the words themselves, wrapping our mouth around words we wouldn’t have first chosen to utter, can do a great healing, transforming work in our hearts. As we speak, things change. The words we speak have power. All this has impressed on my heart again, how wonderful it has to worship a God who speaks. He has spoken his word to us. We have it to read, on each and every page of the written word, the Bible. As we speak those words out loud, to ourselves and to those around us, things change. Speakers and hearers change. We’re challenged, sometimes comforted, sometimes left feeling uncomfortable. But never left left unchallenged or unchanged. God’s word never changes…but it sure changes those who speak it and hear it spoken. This blog started out focused around my table. That’s not to say that all posts had to be about food, or my table, for that matter. In the past few months, the focus of my writing has been on rest, down streets, in books, and sometimes less frequent than I’d have liked. In short, my focus has been ‘all over the shop’! This is not to say that nothing has been happening at my table. I’ve had a lot of ‘visitors’ – just not many of the ‘present’ or ‘live’ kind – though I’ve enjoyed many games of Scrabble with my brother at my table (he, you’ll be pleased to know, is both live and present). At my table, I have been keen keeping company with several men. Dale (or Ralph – I’m never quite sure which name he’d like a friend to address him with) has been providing much food for thought in recent weeks. Dale Ralph Davis has written two books on the Psalms – each book covering 12 Psalms. The first, ‘The Way of the Righteous in the Muck of Life’, I read some time ago. The second, ‘Slogging Along in Paths of Righteousness’, I finished yesterday. I’ve read both while consuming my porridge of a morning. As I’ve kept company with Dale (or Ralph) and his examination of the Psalms, I have therefore also kept company with David (writer of many of the Psalms). It has been very helpful to spend time with the words of one who has trusted in, and cried out to, his God. Those words have encouraged me to ‘keep company’ with the same God. This morning, I moved onto another book by Dale (or Ralph) – a collection of sermons he preached on the book of Jeremiah. I look forward to keeping company with this intriguing prophet for some breakfasts to come. Today, I fancied some soup. I had swept up some autumn leaves in the back yard of the apartment block where I live – and I fancied something simple and warm for lunch. I turned to Marcella Hazan’s chapter of Soups. Her ‘Chickpea Soup’ required no shopping on my part. I had a tin of tomatoes and a tin of chickpeas. I had some beef stock. I had some garlic. I had some fresh rosemary in the garden. 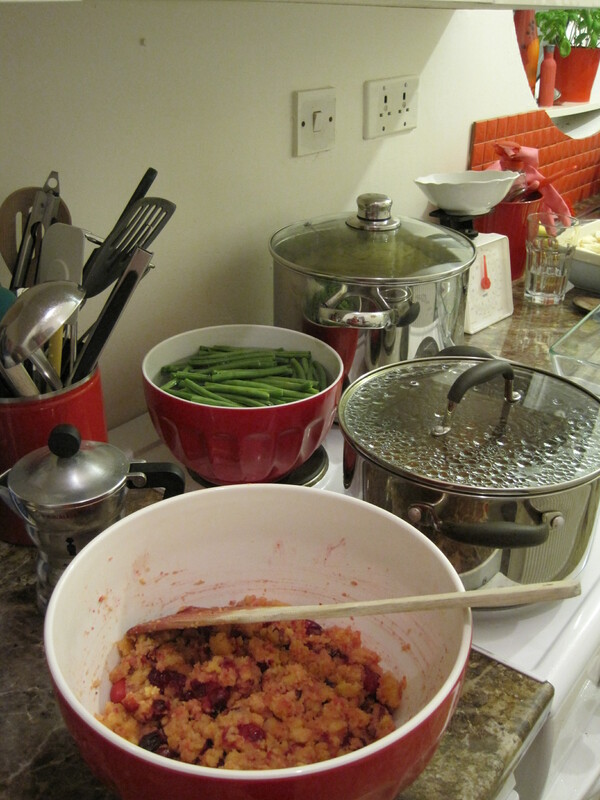 It was took little effort to make the soup and little effort to invite my neighbour to join me. After keeping company with men who were not present and, in the case of Jeremiah and David, not live, it was good to have a live, present, woman sharing a meal with me – at my table. 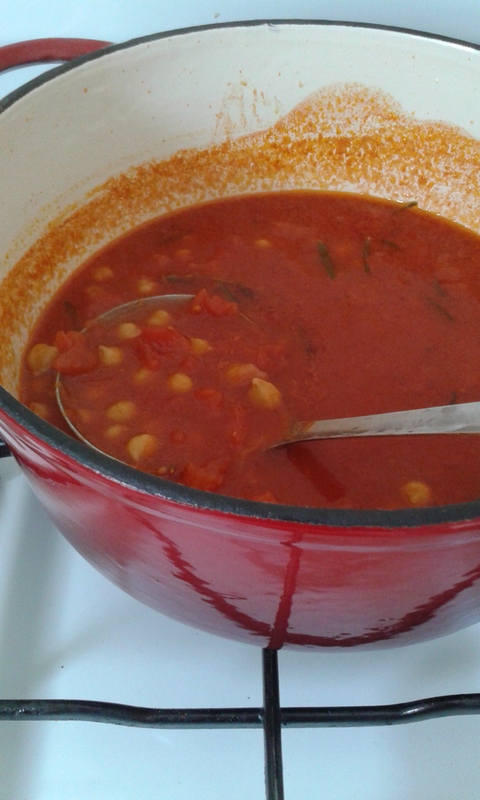 Lunch Today: #118 ‘Chickpea Soup’ with Phillippa at my table. This week I’ve felt weak. Weak in my thinking, my speaking and in my body. Extended headaches have reminded me of my weakness many a time over the past days. It’s all very well to decide to feel victorious and upbeat, but then headaches have a way of bringing you back to reality. It has caused me to reflect a lot more on God’s unending, unfailing strength. I have been reading through the Psalms these past few months, and this morning reached one of the several Psalms that mention God’s wings – and our hiding under them. In Psalm 61, the hiding under God’s wing is associated with rest and safety and relying on his strength. It’s a beautiful ‘feathery’ image. One I have been reminding myself of during the course of today. If my headache is induced through the tension of feeling and living weakness – then the antidote is likely to be something (everything) to do with resting in someone else’s strength. A few days ago, a friend came around to take me out for a walk and a coffee with her young son. We sat in the park in the sun and, while the son took great delight in pretending to stumble and fall but managing not to, we minded his toys. Buzz and Woodie are heroes of mine. I love their different qualities, their vision and leadership. 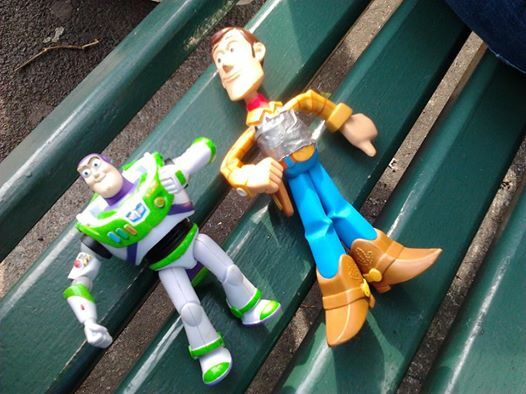 Somewhat ironically that day, I discovered that Buzz’s pop-out wings were no longer working (there was no travelling to infinity and beyond for Buzz that day) and Woody was held together with gaffa tape which made him look like he was wearing a back brace. They were little animated ironies, resting on the bench between my friend and I, as we reflected on our weakness and God’s strength. I shouldn’t be surprised at my weakness. I’m not alone. I follow a Saviour who strong-armed death in weakness – the weakness of facing a humiliating death in my place. Dying and conquering death by living again, so that I could live and find rest. 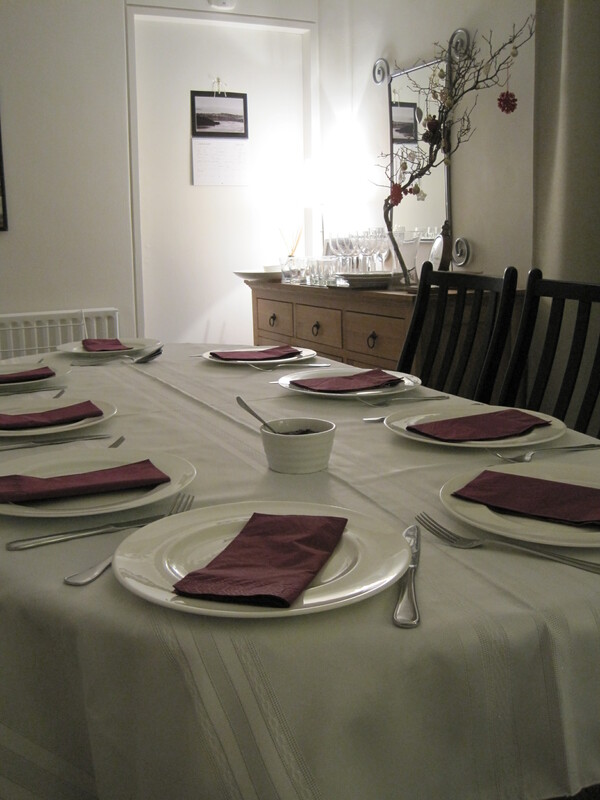 This evening, and earlier in the week, I had a couple of friends for meals – simple meals. Meals cooked in weakness. Sausages with Red Cabbage, and tonight Fennel Salad to accompany some sausages cooked on the BBQ. Psalms, Sausages and a Saviour. Just what the doctor ordered! This week: #53 ‘Pork Sausages with Red Cabbage’ and #54 ‘Fennel Salad’ with an Irish student and an Australian Ambassador at my table. This morning I walked to the bank to pay my electricity bill into my landlord’s account. Apparently I can’t do that anymore. An older lady was standing in the middle of the newly renovated banking room. A room now filled with cubicles where you go and take care of your business. Only it seems there’s not much business you can take care of in those cubicles. Not anymore. The lady was the only human in sight. She was clearly employed to help me – help me realise that I could no longer be helped here. The butcher was there to help me. He wanted me to know that. Later today, I and another listening ear, had lunch with a woman we so wanted to help. We offered help. We asked how we could help. We tried to help by listening. In the end we all agreed that there wasn’t all that much we could do to help. Her situation was a pretty desperate situation and one that wasn’t likely to go away anytime soon. God, our loving, heavenly Father, was there listening today. We heard words from his song book, Psalm 139, of his intimate knowledge of us and his hand that holds us fast when others cannot, or will not. His hand holds us fast even when other hands may be letting us down, dragging us down, grasping at our life in ways we can’t control. We could hold this woman’s hand in support but ultimately we were left with just one source of help – and we spoke to him in prayer and trust. We were taking it to the only one who can offer real help. Courgettes are in season (‘zucchinnis’ for those in Australia – and no, they’re not in season there). In a cookbook with 466 recipes it is relatively simple to find a recipe which will make use of seasonal ingredients. Tonight, it was ‘Risotto with Courgettes’. It took longer than a risotto would normally take to cook – I hadn’t taken into account the extra time needed to cook the courgettes. But my visitors were patient and the extra stirring required of me could only serve to burn off a few of the ‘parmesanal calories’ soon to be taken on board. The taste was worth the wait. We followed the risotto with a dessert of spiced, poached pears – not a Marcella recipe but taken from a magazine some time ago. Not quite seasonal – pears are at their end – but still lovely. A bit like having ‘mulled sherry’ with one of your five-a-day! So easy! So delicious! This morning, I started reading through the Psalms. Well, I started with the first Psalm and we will see how far I get. I was reminded that the blessed woman is one that meditates on the Lord’s word day and night and, like a tree planted near a river, bears fruit in season. This ‘season’ in my life doesn’t feel terribly fruitful – but tonight, as I slowly sautéed the courgettes and gently poached the pears, I trusted that God would bring fruit from this season of life – in his good time. 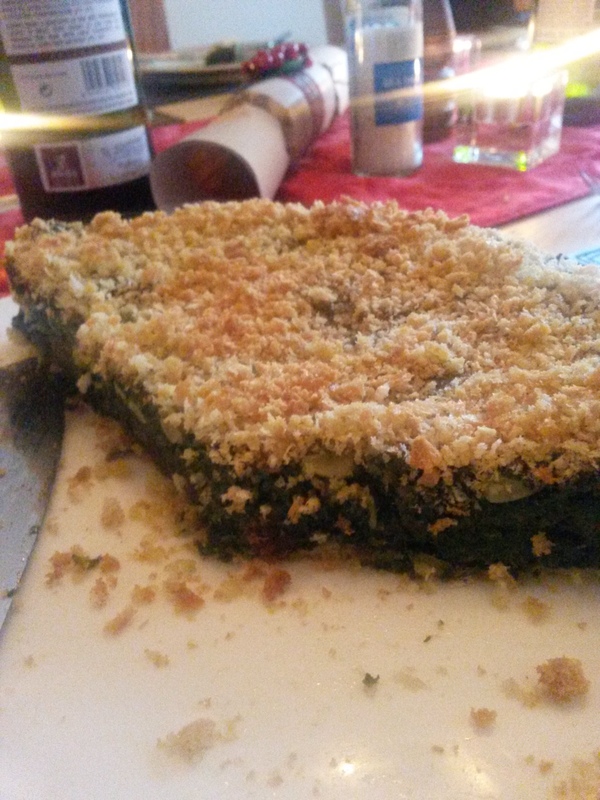 Today: #10 ‘Risotto with Courgettes’ with Stephanie and her friend, Laura, at my table.